but she is a no-reply blogger! so here are the details for you, Linda! Ends up looking like this! I messed up the quilting! This little block measures 3.5"
Golly, whenever I see the cover of that 30's book I think of my unfinished arcs. I love your teeny churn dash, such cute fabrics. Oh I love that little churn dash block, such pretty fabric! So what is going to happen to the quilt. Can it be saved? Love a teeny churn dash! I really was shocked at how small some of the pieces are in that quilt! Jen Kingwell is so incredibly talented. Your quilt is going to be fabulous! Oh cute little churn dash...you stole my heart!! Your little block is lovely. 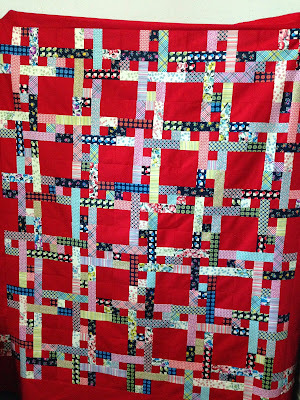 How was the quilting messed up on that quilt, are you going to rip it out and try again?? It is a lovely quilt and it would be a shame not to see it finished, I have to be in the right mindset to finish quilts like that. 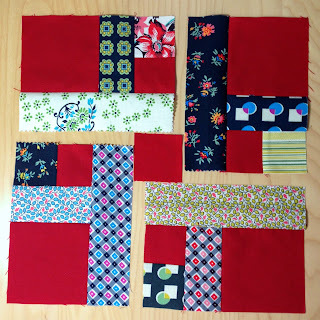 I haven't pieced little blocks for ages so I'm really looking forward to making My SMall World. 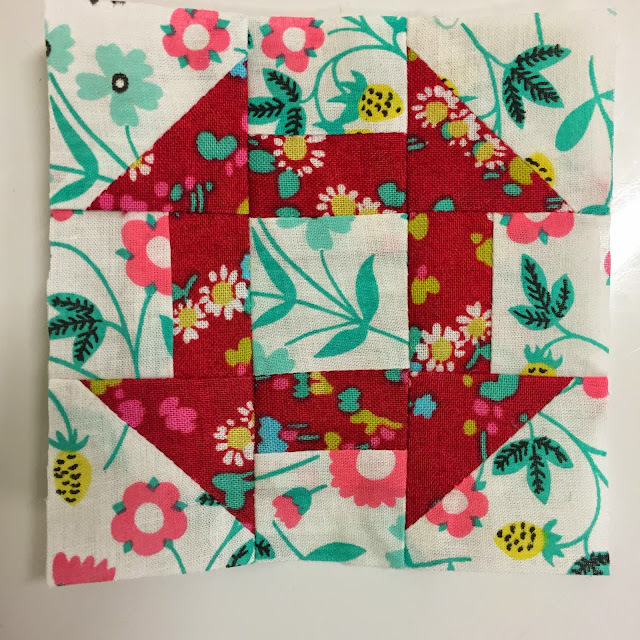 A very pretty churn dash block, so tiny! I too am wondering about the fate of that quilt? The Denyse S. fabrics look great with all that red! I'm looking forward to your My Small World shortcuts. Planning to start mine this week. Love the churn dash and that first one looks a lot like Subway! 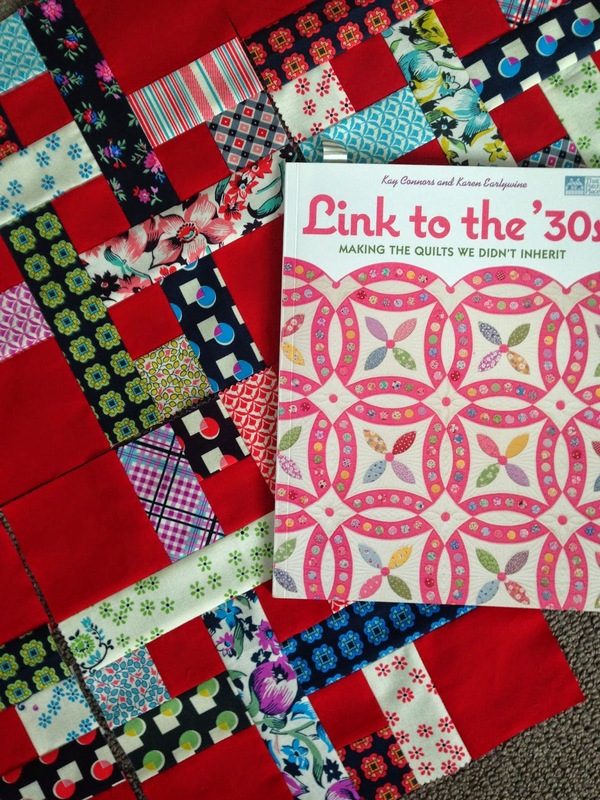 "making the quilts we didn't inherit" - very passive aggressive!! I think the author may have a chip on their shoulder! I think you're going to have to give it another go Suz - either unpick or some other clever way to fix the quilting. That top deserves to be out and proud! Look at that tiny churn dash, I love it!! It's hard to keep things accurate when the block is that little. Yours is perfect! Won't you take time to unquilt the one that isn't quite right? I hope so! I'm a big fan of Churn Dash blocks, no matter what size. I've made that block often... haven't we all? You messed up the quilting? I hope it wasn't serious.